The Jumbos had quite a bit at stake going into Homecoming week. Sitting at 5–0 and ranked No. 3 in Div. III, three crucial home games lay before the team: Wesleyan, Amherst and Hamilton. The Jumbos swept the three conference opponents last year and sought to do the same and improve to 8–0, their best start since 2010. Tufts delivered in a big way, crushing Wesleyan on Tuesday and beating Amherst and Hamilton in tight matches over Homecoming weekend. 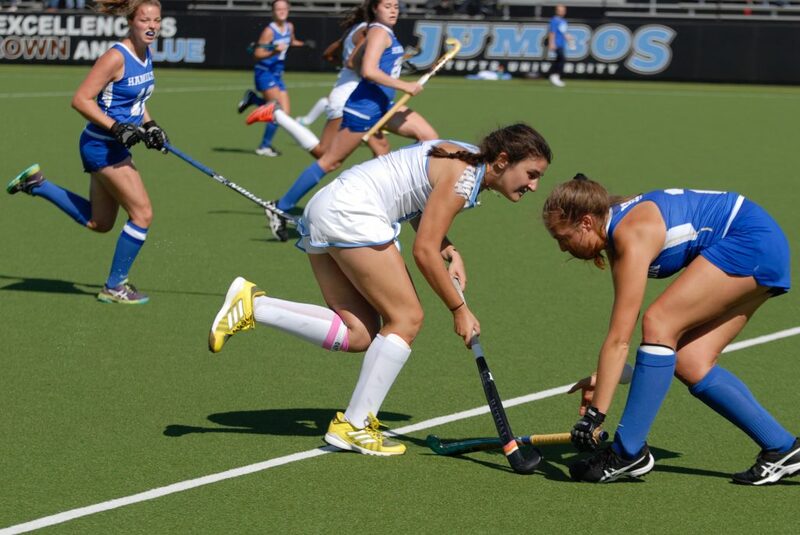 Tufts now sits at 5–0 in the NESCAC, tied with Middlebury for the conference lead. The No. 15 Hamilton Continentals (7–2) proved to be a considerable challenge for the Jumbos, evidenced by their strike a mere three minutes into the game. Senior forward and co-captain Tatiana Bradley sunk the shot for the Continentals, immediately putting the pressure on the Jumbos to respond. Tufts was not able to do match the visitors’ intensity, as Hamilton excelled at limiting a high-quantity attack, allowing only nine shots in the first half and 16 overall. The Jumbos’ defense was no slouch, either, only allowing four shots total. In the 42nd minute, Tufts senior forward co-captain Gigi Tutoni put a rebound shot into the net to tie the score. A little more than 13 minutes later, a beautiful entry pass from sophomore defender Melissa Manzello led to a strike from junior forward Rachel Hamilton, giving the Jumbos the lead. The Continentals worked tirelessly to even up the score in the waning minutes of the game, even pulling Booth from the goal for an 11-player attack in the final three minutes, but to no avail. Senior goalkeeper Emily Polinski and the Tufts defense held strong, coming away with a 2–1 victory for their efforts. The victory was a milestone for coach Tina Mattera, as it was her 200th win with the program in her 15 years at the helm. The Homecoming game on Saturday against the No. 18 Amherst Mammoths (4–3) proved to be another thriller. The game had a bit of an odd start, as a scheduling mishap with the officiating crew led to a near-two hour delay before the game finally kicked off. Much like the match against Hamilton, Tufts had its back against the wall early, as a penalty corner led to an Amherst goal within the first 12 minutes of action. This time around, though, the Jumbos did not have to enter halftime with a deficit, as a penalty corner led first-year midfielder Sophie Schoeni to deliver a tight pass to Hamilton, who scored comfortably in the final minute of the half. The Mammoths refused to go away, though. A solo goal by sophomore forward Franny Daniels put Amherst back on top early in the second half, as the visitors converted on their only two shots of the game. Once again, the Jumbos had to find a way to keep their undefeated record intact. Only a few minutes later, Hamilton’s shot deflected back into the air, where it was struck into the back of the net by Tutoni, evening up the score again. The rest of the half went by without a goal, so the Jumbos faced overtime for the second time this season. Overtime did not take long. Less than two minutes into the period, an Amherst turnover turned into a quick transition attack by Tufts, and Tutoni delivered the game-winning shot to secure a 3–2 Homecoming win. On Tuesday, the Jumbos put up their best offensive performance of the season against the Wesleyan Cardinals (3–5), putting up eight goals, six of which came in the first half. The goals were impressively distributed, as six different players scored. Tutoni’s two goals in the contest contributed to what ended up as a five-goal week for the Newtown, Pa. native. Her performances earned her the honor of NESCAC Player of the Week. The defense was stellar, as well, allowing Polinski to rest after the first half to give first-year goalkeepers Emma Smith and Andie Stallman reps. The goalkeepers did not have a particularly hard day, though, as the Cardinals only put up two shots in the contest, neither of which were on goal. The Jumbos’ biggest challenge of the season comes Saturday on the road against the No. 1 Middlebury Panthers (9–0). With both tied at the top of the NESCAC at 5–0, the match has serious implications on who will take the conference crown. Action begins at Kohn Field at 1 p.m.